Admission to the museum is donation based. Admission to the garden is always free. There is a fee for group tours over 10 people. Please contact Naiomy at 212-304-9422 to make an appointment. 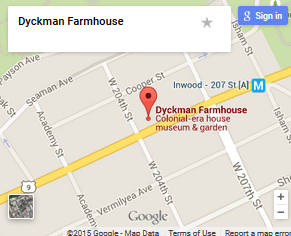 The Dyckman Farmhouse Museum is located in the Northern Manhattan neighborhood of Inwood and is easily accessible via public transportation. Take the East of Hudson Line to Marble Hill Station. Upon exiting head right towards Broadway and the elevated tracks of the 1 train. Take the 1 train downtown to the 207th Street stop. From the 1 train at 207th Street walk west on 207th Street until you reach Broadway, then walk south to 204th Street. Alternatively, after exiting the Marble Hill Station and heading to Broadway, catch the Bx7 bus at the corner southbound to 204th Street. There is no parking at the farmhouse. There are meters on Broadway and parking can be found on side streets. As anywhere in Manhattan, parking is a matter of luck! There are several parking garages in the area.